Extremely colorful pictorial map of the Hawaiian Islands. The Dole Map of the Hawaiian Islands. 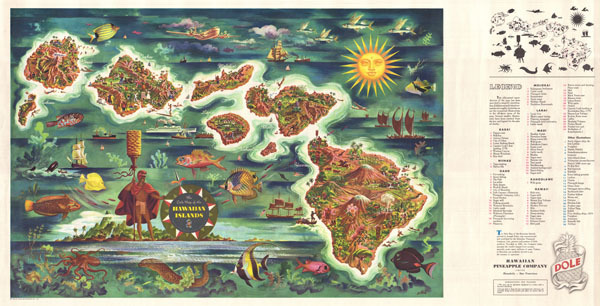 A large decorative pictorial 1950 map of the Hawaii by the artist Joseph Feher. This broadside map covers the eight major Hawaiian Islands in full color with a host of decorative elements including scenes of Hawaiian life, tropical fish, ships, volcanoes, and tourists. To the right of the map is an attached legend detailing the various elements of the map – this part of the sheet is designed to be folded behind the map for framing purposes. Issued by the Dole Pineapple Company in 1850. Joseph Feher (1908 - 1987) was a Hungarian born watercolorist active in Hawaii from about 1930 - 1960. Feher fell in love with Hawaiian history and culture and completed a number of pictorial watercolor maps of Hawaii for the Dole Pineapple Company and for United Airlines. For a time Feher also worked as a senior curator for the Honolulu Academy of the Arts where he compiled an encyclopedic history of Hawaii called Hawaii: A Pictorial History.